For many years L and I have attended the Summerland Festival, organized by our ADF kin of Sixth Night Grove in Dayton. Held at a pleasant 4H camp in the woods, the event features high-quality program, good fellowship and an excellent Saturday music night. This isn’t a full review of the event, but I want to tip my hat to the fine group of bards working in our region. Talent is best graced by skill, and the increases in skill and confidence to be seen are marvelous! Summerland has given me the chance to do some of my favorite experimental magic over the years. 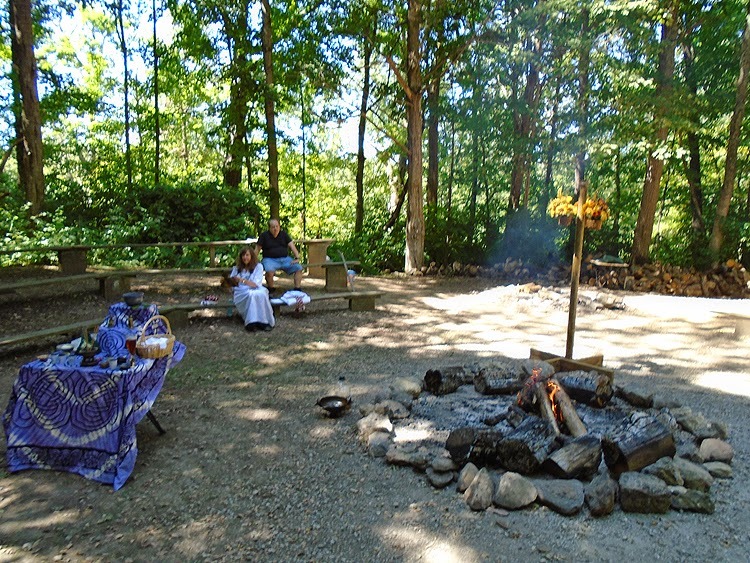 I did early Core-Shamanism-style ally rites, introduced the 9X9 divination system and did the first Court of Brigid rite in the ritual space (actually the ‘camp-fire circle’ of that 4H camp) there. Not being an organizer leaves my mind available for real magical work – something I just can’t manage at, say, Starwood any more. This year our program piece was a rite of cleansing and purification, based on work I wrote last winter. It is part of an effort to devise ways to use magico-religious work to affect change in the hearts and spirits of people. I’m more of a teacher than a healer, by inclination, but the work of priesthood in our time seems to demand some degree of work focused on the ‘cure of souls’. In our time people come to spiritual work seeking personal healing, comfort and restoration. Maybe they always did, but I think that in ancient days they didn’t expect to get it from priests of the gods. However they did expect priests (loosely defined) to be able to relieve “ritual impurity” (See my previous article here). When life brings us into contact with traditional sources of impurity it is traditional ritual that relieves it. The script for the large rite I composed is here . Approaching performance of the rite our primary concerns were adapting it for a larger-group performance. The rite is really composed to be worked by an operator on an individual or small group of clients and their witnesses, and in that form the ritual gestures would be able to proceed smoothly and rhythmically. However we were mounting this for 30 – 40 people (final # about 36, if I counted correctly). 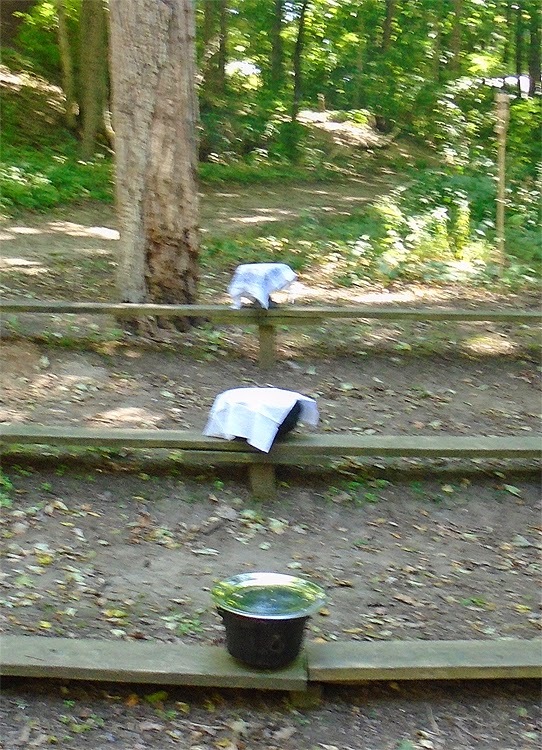 The Three Blessing Cauldrons, ready. Most central, the rite calls for the hands of the clients (i.e. everyone, in this case) to have their hands laved with water from the blessed cauldron. My first inclination was to do the old receiving-line, and have folks parade past the big ritual cauldron to receive their cleansing. Boring. Finally we decided to set three Blessing Bowls up the center of the seating area, and hallow each of them with the blessing. 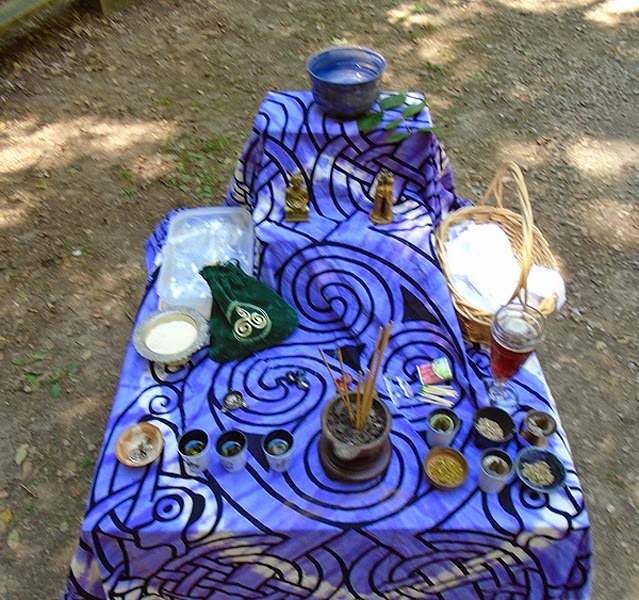 We decided that the clients would actual cleanse one another, grouping around the three cauldrons. To do this we would give each of them a spoon. My reading has taught me that traditions that cleanse with water frequently do not use their hands to do so – most usually a ladle or spoon is used to dip water cleanly from a sacred pot onto its source. So it was clear plastic spoons for all. The final adaptation of the original script was the choice to sing the two key incantations. My goal in the work was to induce trance with a minimum of spoken guidance, allowing the crew to find their own requirements for purification, and to focus solidly on the mechanics of the rite as conveying the blessing. The litanies of water and fire in the text seemed long to me – induction through boredom is doable, but doesn’t get return trade. So I decided to add intonation and a mantric chorus-sing to the water-blessing, and to sing the fire-blessing as a hymn. We worked the rite on Friday afternoon, and the shadows of the trees had perfectly covered the seating area we were using for the rite. We encouraged the crew to group around the blessing bowls, and distributed the spoons and cloths. L and I opened the work with a simple offering to the Three Kindreds (Land-spirits, Ancestors and Deities, for new readers). In this we honored first the general category of each Kindred, then added a more specific call to beings proper to the intention. In this the Landwights was the most difficult, and a contemplation of how they may relate to ritual impurity and purification might be proper. I note that I might have offered to the spirits of the material water and fuel which we used in the rite, had I thought of it. Along with a general call to the Ancestors we called to Grandmothers and Grandfathers, understanding them as keepers of custom and rule surrounding purity – ‘reproving and compassionate’. Along with calling to the Gods in general we asked Brigid and the Dagda to aid us. This choice will be obvious enough, especially given the core fire-and-water symbolism of the rite. In parsing the sources of power for the rite, I go first to the innate power of water and fire, to which are added various natural-magic components. Secondly the consensus and cooperation of the community empowers the purification and return to normalcy. To these are added the special blessing of the Kindreds, brought through sacrifice. All in all, the performance went well. L and I were pretty well in-tune, and our ritual performance partnership is a reliable support. We worked the initial sacrifice unscripted, then resorted to scripts for the detailed invocations. All in all we could have used more hands. I found myself sitting down to drum and lead the intonation, and still required to speak parts. In terms of my own trance I was able mainly to channel intent into the singing of the choruses, my attention otherwise divided between aspects of the progress of the work. I was forced to rely primarily on the design and execution – I wasn’t pushing a lot of juice myself. The scrum around the blessing bowls was not too bad. Everyone got their nine lavings accomplished in just a little longer than the performance of the Hymn of Cleansing. Perhaps having operators at each of the bowls would be helpful, but I do like the mutuality of the community cleansing one another. The second phase of the cleansing is the purification by fire. In the Two Powers analysis of the rite’s formula, the Underworld Waters are first used to dissolve and wash away impurity. The Fire of the Heavens is then used to restore original pattern, empower the target’s system, and to ‘purify by sunlight’. So we prepared small, portable fires, by simply lighting very fresh incense cones and not blowing them out. My experience has been that this will produce a 5-minute, sweet-smelling flame that, even if it goes out, will produce a pleasant cloud of smoke. In this case we got all three flames back to the work-table intact, so that worked just fine. So did singing the entire Hymn of the Flame, though I could regularize the verses a little more. The original script called for blessing and passing a cup on completion of the Water and Fire. We were afraid of going too long, and excised it. In the end the working took about forty minutes. That tells me I could leave that module in place – I like the idea of the newly-purified folk sharing a cup. Oh, one radical element of the rite was the Confession. In keeping with what I have discovered about purification work, a Hymn of Confession was recited prior to the cleansings. This led the crew to admit to a series of abstract errors or failures of virtue, and provided a moment for each to contemplate what impurity they might bring to the work at hand. This feels controversial, and the final text was the result of some discussion here at home. In the end the folk made no objection, and it seemed a fit and useful part of the formula. The feel of the rite by the end seemed properly blessed and joyful and, as we burned the cloths in the ritual fire, it seemed to me to lighten. The emotional responses in the crowd were varied, from obvious delight to some examples of tears and obvious introspection. Several folks took occasion to say that the rite had pushed some of the buttons that were targeted, and all in all I consider it a good first performance of a fairly complex rite with fairly complex goals. I want to thank the Summerland folks again for the opportunity and support (and Sai for building and tending the Fire), and thank all who participated. May we grow in wisdom by the work.